1. “Oh my gosh! I am going to be a dad! 6. If its a girl do i have to play “dress up”? 7. Im definitely not wearing one of those baby carrier things! 8. If I have a daughter she is never dating? 9. I will never be a dorky dad! 10. I will never get a minivan! Happy Father’s Day to all you awesome dads out there! Yesterday was “one of those days.” Where I was that mom and my son was that kid… My incredibly sleep deprived self, got my kids up and at ’em, dropped my hubs off at work (I see you one vehicle families) and headed to summer book club! Shout out to all you ladies who so kindly and graciously helped me in my state of craziness. I hope the crazy exit we made didn’t keep you from hearing from the Lord! I knew I had to leave early for Jaxon’s speech therapy but decided to go anyways. I was really excited and knew Jaxon would have a great time playing with his friends and it would be a win for all of us. Isn’t is great when your kids throw you for a loop? As it turns out, my son is not the super human who can function forever without sleep. Apparently the perfect storm was brewing and decided to hit. In the middle of book club. I know that the ladies I’m surrounded by are all incredible and godly moms who were most likely not thinking about how I obviously don’t have my crap together and have no control over my kid. I know that they are AMAZING and probably felt sorry for me and empathized with me. I know thats how I feel when I see other moms in the same position. Kid screaming and throwing a fit, baby crying because she’s hungry, making a very loud and disruptive exit. And I thought I would just sneak out. Um no, not happening. All of this after my toddler dumped toys out everywhere and kept screaming and having meltdowns. Did I mention all the other children were perfect little angels? As I sat in the car, I immediately began texting my husband and telling him all about how horrible our child had been and how embarrassed I was. I told him that I was never going back to book club again. How I felt like a horrible mom. How I don’t have any idea what I’m doing at this momming thing. How I just felt like I couldn’t get it right. Some days go like this. Some days I feel like a crazy person. Some days I feel like I’m barely holding it together. 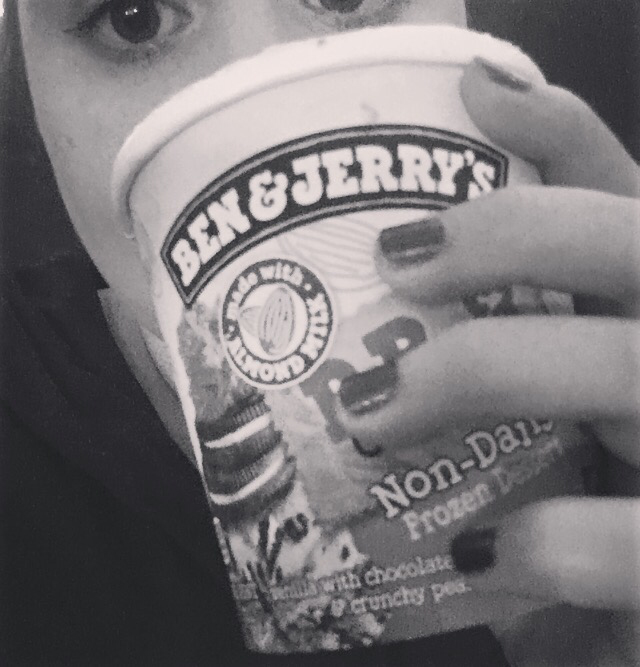 Some days I have ice cream for lunch. But what happens when thats not enough? What happens when everything I try to do to comfort myself fails? What happens when nothing is good enough? I find that when I try to do this on my own, I fail epically. Ever since I became a mom, I’ve felt clueless on what I’m doing. That’s why it’s vital that I rely on the Lord. I am daily aware of my weakness. While I can use that to remind me of my need for the Lord and the importance of dwelling in His presence, I tend to allow the enemy to use my weakness to imprison me. The enemy likes to leverage these moments against us. Remind us of our shortcomings and hold us hostage. He likes to feed our insecurities and negative thoughts so we don’t receive what God has for us. How easy it is to allow the enemy to have this power over us. How easy it is to focus on our weakness instead of the Lord’s strength. Live in the Lord’s strength, freedom, and grace today. You CAN do it because God’s got you! He supplies all that we need. We just have to ask Him. Prayer: Lord, help me and anyone else who is struggling with this. 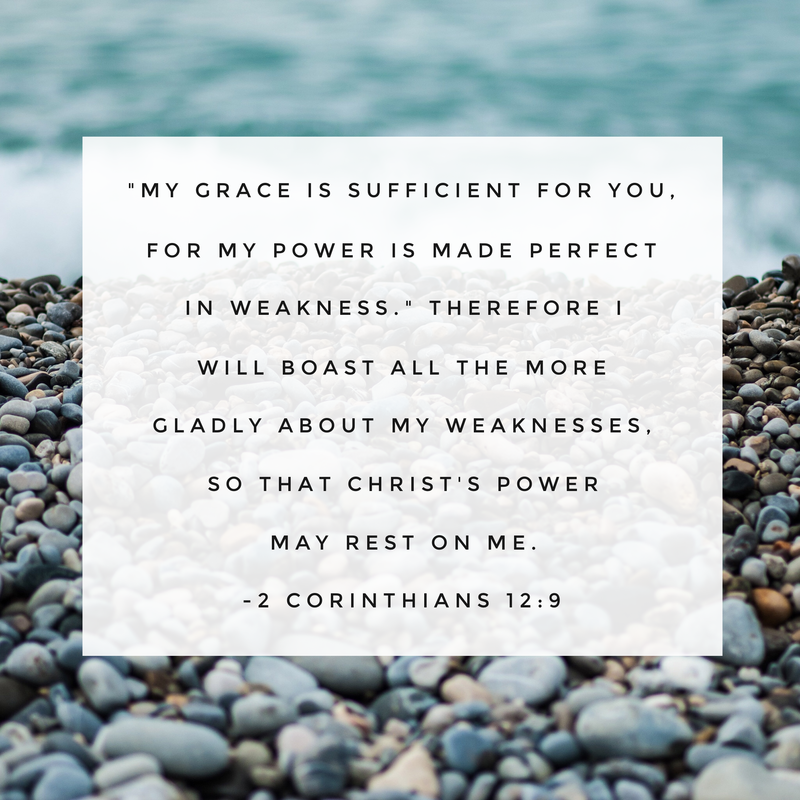 Help us take our eyes off of ourselves and our weaknesses and place them on You and Your perfect strength. Help us to rely on YOUR strength and not on our own. Fill us up. Encourage us. Take over our way of doing things and help us to walk in Your ways. Amen! Action: When you find yourself dwelling on your failures and shortcomings, refocus yourself on God’s perfect strength. Allow Him to lead you instead of doing it alone. I am so thankful for my amazing mom friends. I am thankful for the ones who call to encourage me when I feel like giving up. Thank you to every lady who checked on me and empathized with my day. I love you! Surround yourself with these types of ladies and be that girl yourself. Love you all! Let’s take on life together! If you are a mom to any baby, toddler, child, teenager, (or husband) you probably know how hard it is making it anywhere on time. If you do NOT know the struggle of being on time as a mother, please, Please, PLEASE give me your secret! Like, immediately!!! So as I muddle through life trying to be on time, Sunday mornings tend to be one big epic fail every week. Why can I not get the hang of this? It comes EVERY SINGLE WEEK! So… here are my top struggles EVERY SUNDAY. 1. Your toddler refused to sleep the night before. 2. You promise yourself you WILL be on time today! 4. You do your makeup with a toddler in your lap. 6. All ready to leave…. someone poops. 7. You can’t handle one more meltdown. 8. One last look in the mirror. 9. Finally get in the car, suddenly the baby is STARVING. 10. Your child hates the constraints of his carseat. 11. Pull into the parking lot and try to get your crap together. 12. You are late. AGAIN. 14. You make it into the service! 15. You get a call to come get your kid out of the nursery. 16. Someone asks you to lunch during nap time. 17. Your house when your get back home. 18. You get a Sunday nap. But in all seriousness, Sundays can be hard. I find myself wondering if the struggle to make it to church is worth it and every single week I am glad I did. Moms, you are awesome and you’re not the only one on the verge of losing your salvation while trying to make it to church. Lets stick together and encourage one another! You got this! Thanks so much for stopping by Heart of a Girl, a blog about life, ministry, and raising kids. I am by no means an expert at these things. I am constantly learning and growing on this journey (with quite a few mistakes along the way). Even if just one word, one sentence, one post encourages just one of you out there, then this is totally worth it!